For Christmas, Sharon got herself, Drew, Jack and I 23andMe ancestry genetic tests. Although I self identify as Dutch, I have always known that I was English (Holmes and Abbott), German (Lorbeer) and Dutch (Heringa). 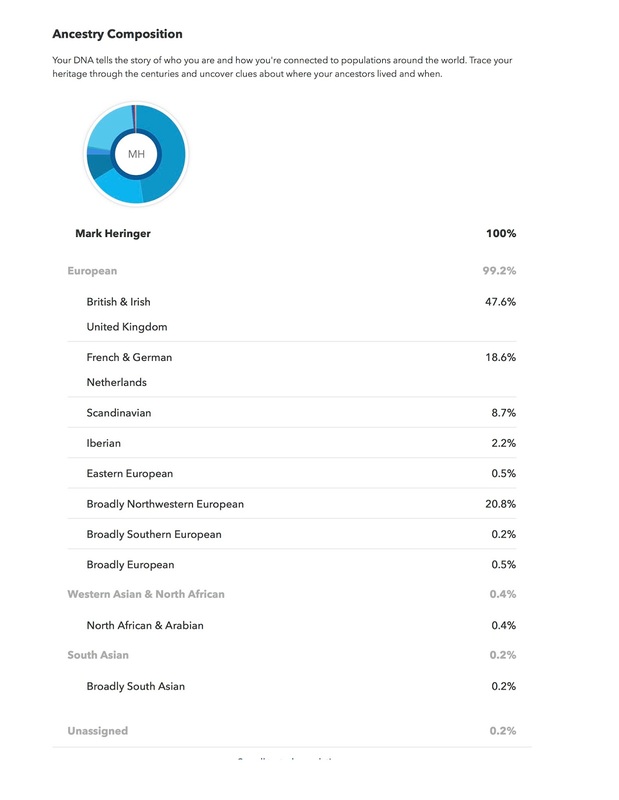 The results of the 23andMe genetic test show that I am 48% British and Irish, 19% Netherlands and 21% Broadly Northwestern European. What surprised me was that I am 9% Scandinavian and 2% Iberian (Spain and Portugal). Even more surprising, there are very small pieces of North African and Arabian (0.4%), Broadly South Asian (0.2%) and Broadly Southern European (0.2%). I am going to post a couple more pieces of the results in the near future.